The Canadian economy has grown at a stronger-than-expected annual rate of 3.7% in the past year, taking the jobless rate down to its lowest level in nearly a decade. With Canada’s economy the strongest in the Group of Seven countries, Ottawa now projects much smaller deficits than it did in March. The Liberal government cut its deficit projection for the fiscal year that ends March 31 to just under $20.0 billion, down from $28.5 billion in the March budget. It now expects a cumulative deficit over the coming five fiscal years of $86.5 billion, compared with $120 billion previously. Finance Minister Bill Morneau announced new spending today totalling $7.7 billion over six years, bringing the total new spending since the March budget to $19.1 billion over six years. This additional stimulus comes as the economy is running far faster than its long-run potential noninflationary pace, rapidly approaching full capacity. The Bank of Canada has already raised interest rates twice since the summer and meets again on Wednesday. While we do not expect the Bank to hike rates tomorrow, additional fiscal stimulus runs the risk of ever tighter monetary policy–meaning higher interest rates than otherwise would be the case down the road. Higher interest rates slow interest-sensitive spending and nothing is as sensitive to rates as home purchases. With all the government’s concern about the record level of household debt, tighter monetary policy might well be welcome. The government has already taken repeated actions to slow the housing market. Most recently, the federal financial institutions’ regulator, OSFI, has tightened the stress testing for non-insured mortgage borrowers effective in January. Deficit spending, particularly the enhanced child benefit system, has undeniably been fueling consumption. The government announced today it would index its marquee Canada Child Benefit to inflation beginning in July 2018, two years earlier than scheduled. It also expanded the Working Income Tax Benefit, which supplements the earnings of low-income workers, starting in 2019. It also reduced the small business tax rate to 10%, announced last week, and it snuck in changes to the tax system that “ensure low corporate tax rates go towards supporting businesses, not to the top 1% of income earners”. In that regard, Ottawa is proceeding with a new tax on investment income held in private corporations and will detail the measure in its 2018 budget. 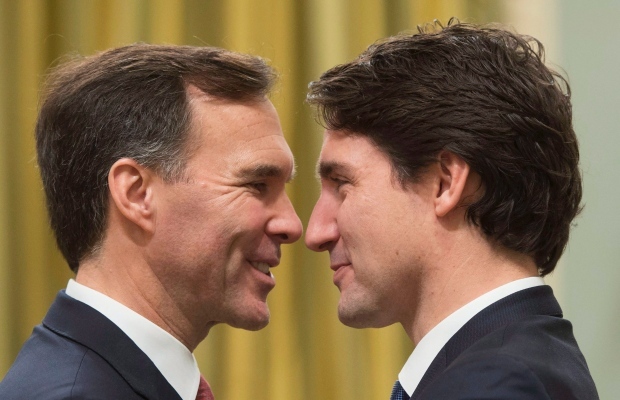 Trudeau’s team has been backtracking on a trio of tax proposals unveiled by Morneau in July and offered new details in its update on Tuesday. It will proceed to restrict so-called income sprinkling — paying family members who don’t work for a firm — with new legislation due later this year. The Liberals will also tax investment income held in private corporations when it exceeds $50,000 annually, releasing rules for that in its 2018 budget. It has abandoned a third proposal, which changed capital gains rules. Despite the improved economic outlook, there is no forecast to return to budgetary balance, although the debt-to-GDP ratio does fall more rapidly than in the 2017 budget.